Two weeks ago I participated in the annual ANZSOG Master Class held at the Melbourne Business School and facilitated by Professors John Alford, Jon Brock and Mike Vitale. The workshop brings together academics from the public policy space and this year the first day was spent focusing on the potential impact of online education and how current teaching practitioners are working within this area. As a part if this I was asked to talk about my own observations and, as I listened to the conversations around me, and thought of the people that we teach within ANZSOG, it reinforced in my mind that the most fundamental education that is needed across the board is to teach digital literacy in order to facilitate digital competency. the ability to effectively and critically navigate, evaluate and create information using a range of digital technologies. … Digital literacy … builds upon the foundation of traditional forms of literacy and brings together: digital information as a symbolic representation of data, and literacy, which refers to the ability to read for knowledge, write coherently, and think critically about the written word. a person utilizing information technology (IT) in order to engage in society, politics, and government participation. As governments the move towards “digital by default”, where “public services should be delivered online or by other digital means” this means virtually all who engage with governments will be required to operate in the digital information space. Therefore, the need for digital literacy will become universal and, in fact, mandatory, if citizens are to both receive government services, but also to hold governments to account and to properly provide governments with the appropriate information relating to their needs. This is a big deal, and with this in mind it becomes obvious why the UK government has recently announced a new curriculum for schools where children from as young as five will be taught how to code, how to create their own programs, and not just how to work the computer but how a computer works, how to make it work for them. They will be taught not just computer science and information technology, but digital literacy. This is all occurring within a business environment where organisations are realising the need to compete for people with “digital” skills, and leaders and executives are beginning to recognise that they need to learn about “open data” and digitisation. As I surveyed the ANZSOG master class participants, I developed a sense or urgency as how important it is already to teach public sector managers and leaders these same skills, before they fall behind both the general populace, but also the demands of the upcoming generation. As a way of explaining the importance of this I developed the following model. 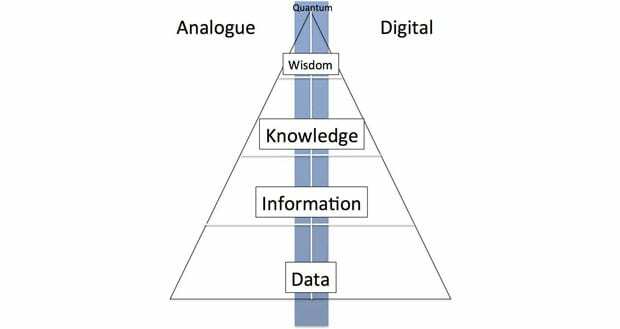 The hierarchy of data, information, knowledge, and sometimes wisdom, is often represented in the following fairly simplistic way. Information used to predominantly be in “analogue” (as in physical) form, on physical substrates (cave paintings, rocks, tablets, printed paper, soundwaves). 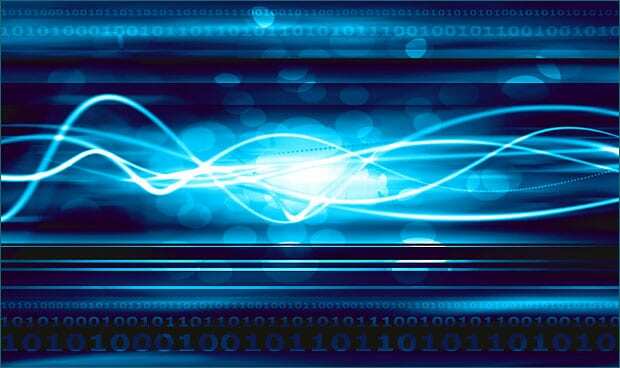 With the advent of electronic computing technologies it is now also “digital” in form as well. (For those wanting to take the next step, it can also be “quantum” in form, that is both physical and digital at the same time). We experience information through the “affordances” of the media we work with (see the work of James Gibson and Donald Norman and Harper and Skellen), and from this we develop a “literacy” around how we work with that information. 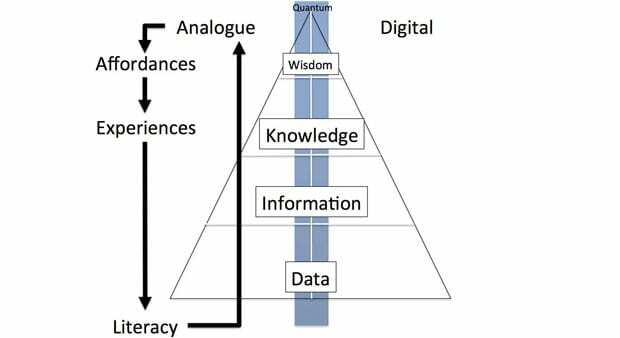 For most of human history that “literacy” related to information in analogue form, and we developed a “literacy” relating to our ability to effectively and critically navigate, evaluate and create information in analogue form. Given the importance of language and communication to human society this specifically meant that we developed the ability to read for knowledge, write coherently, and think critically about the written word. As the amount of information in digital form increases so are our experiences with information in digital form through the “affordances” of digital media. 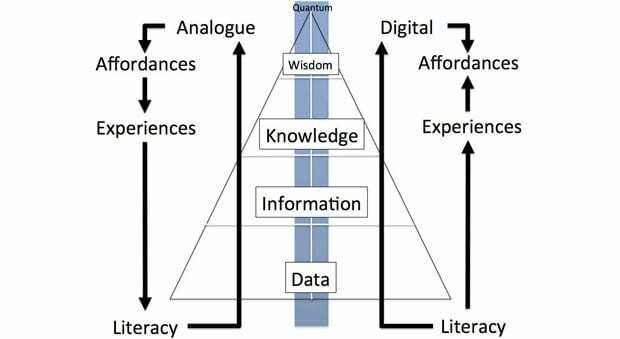 And what is slowly evolving is a literacy around how to utilise information in digital form, which is not a replacement for traditional literacy, but a complement to it. This model seemed to resonate with the ANZSOG participants, and so Peter Thompson and I are now developing some ideas as to how we could integrate this into a broader teaching programme which we will, hopefully, be able to deliver this year. The key to that “understanding” is to develop a “digital literacy”, and I believe it is the responsibility of all who are in positions of leadership and authority to not only embrace this challenge, but to do so with enthusiasm and excitement to build a “brave new world” that we actually want to live in, not one that we suddenly wake up to find that we regret.